Many times a small act of kindness – a smile from a perfectly unknown person, a little flower you got as a gift, the right word in the right moment – has huge consequences… let’s bestow tiny acts of kindness today, let’s make it a little habit… even more when we don’t feel like doing it at all! 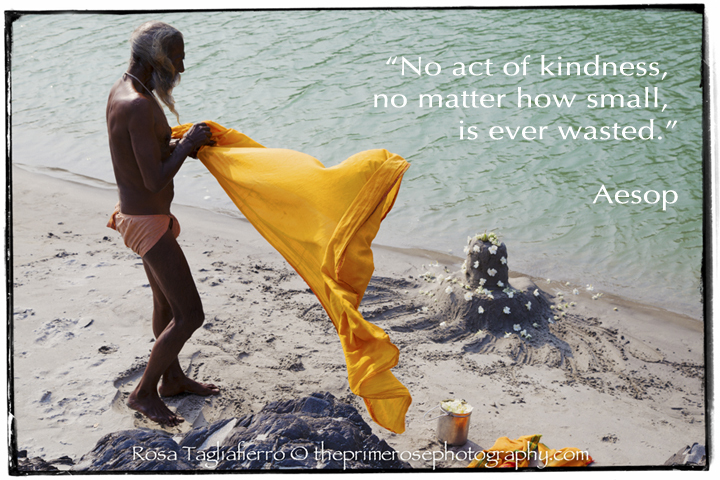 This entry was posted in Monday inspiration and tagged act of kindness, acts of kindness, aesop, India, quotes, Rishikesh, sadhu, theprimerose, theprimerose photography, theprimerosephotography.com, travelling to India, yoga, yoga photography, yogic photos. Bookmark the permalink. 6 Responses to MONDAY INSPIRATION – LET’S FOSTER KINDNESS! What a big truth! Thank’s for reminding me!